It is said that each of us are nothing more and nothing less than a sum total of the people who have passed through our lives. Those influential people, be they family, friends, co-workers, military buddies or former loves, have each walked some portion of our life journey with us. While many of those people became the background characters of our forward-moving lives, some, a precious few, had extraordinary impacts in our experience and played very important roles in shaping our current self. When one of those influential people falls out of our daily life, it can leave a hole that often evolves into an ache. That growing ache is what has driven tens of thousands of people from all walks of life to seek out the wisdom and expertise of Troy Dunn. His tireless efforts to seek out and reunite people with their most important missing loved ones have taken him on a 20-year journey that has become his life's work. While rebuilding over 40,000 fractured relationships, Troy has harvested priceless insights, which have evolved into powerfully effective relationship tools. It is these specific tools that he credits with the unprecedented success he has had in rebuilding lives and relationships. Today, his ongoing efforts to grant the wishes of the hopeful and the hopeless are chronicled in the hit tv show, The Locator on WE tv. 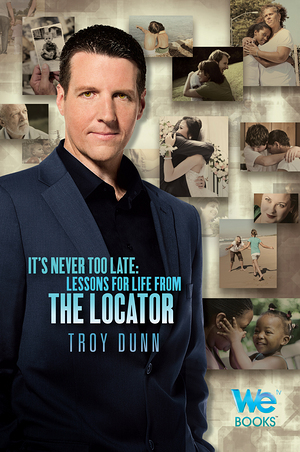 The Locator, now in its 5th season, follows Troy and his team on the ever-changing path to closure, answers and sometimes, tearful reunions and new beginnings. As you read this book, Troy will take you behind the scenes of some of his favorite cases and share with you the relationship tools he used to rebuild and resolve. You will be uplifted, inspired and empowered by the journey you are about to embark on with Troy. But more importantly, when you finish, you will possess the effective tools and resources to manage your own relationships and those of the people around you. As Troy reminds us each week on WE tv's The Locator, You can't find peace until you find all the pieces.